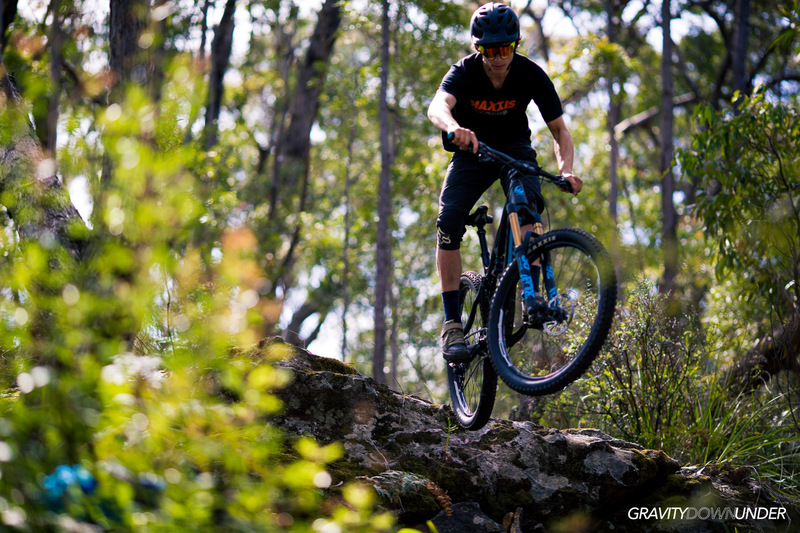 Epic new format for Shimano Bike Buller Festival 2019. Half way through 2017 this bike was released somewhat secretively by Pivot after being under development for a while. Recognising that trail bikes with shorter travel were being used effectively both by everyday riders and also Enduro racers, they created the 5.5 as a slightly shorter travel version of the Mach 6. With 140mm of rear-end travel and 160mm up front, this is a bike that fits somewhere between a normal trail bike and an Enduro machine. 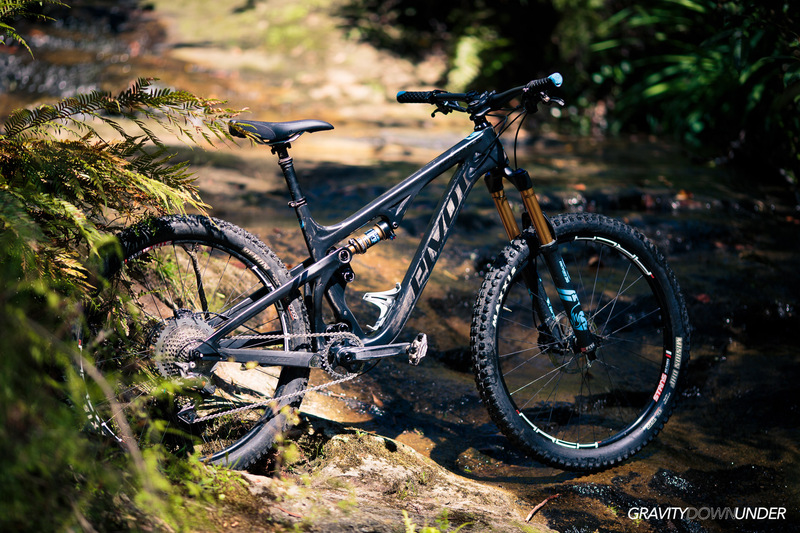 Within the Pivot lineup this is similar to the Switchblade which is their 140mm rear/150mm front 29er/27.5+ machine but with 27.5 wheels only. It’s built around 2.6″ wide tyres, with plenty of clearance on the stays and fork for the wide rubber. The combination of Pivot’s DW Link suspension, wide rubber and short chainstays makes a bike that wants to rip around corners with traction galore. Even on the normally dry, sandy tracks of the Blue Mountains the amount of cornering traction is excellent. Our test bike from the Pivot and Stans distributor JetBlack was specced with Stan’s Arch MK3 wheels front and rear rather than the normal DT Swiss M1700 35mm internal width wheelset (they can also be upgraded Reynolds Carbon wheels with 36mm inner width). The Arch MK3 are 27mm internal and still seemed wide enough for the 2.6″ tyres to fill out to a good profile and survived rocky descents and a few drops just fine in our test period. Over technical, rocky descents the ability for the bike to track a line was exceptional. The stiffness of the rear end and 36mm stanchions up front with 35mm diameter handlebar meant that picking a line and sticking to it was dead easy. I think the wide rubber also helped here in keeping traction through the loose and rocky corners. Despite the short chainstays, the reach and wheelbase are relatively long, and the bottom bracket low compared with older Pivot designs. “New-school geometry” or whatever you want to call it, the bike felt stable at speed and could be piloted around tight corners easily also. I was riding a medium size frame, I would normally ride a Large at exactly 6 feet tall, the Medium felt like a good size with the long reach mesurements. I’d say sizing down for a more playful/agile ride is definitely an option. Maxxis DHF EXO TR 2.6″ up front and Rekon EXO TR 2.6″ tyres out back. At the price it would be better to see 3C versions specced rather than the dual compounds, but they still worked well over a variety of different terrains. They are a bit noisy and draggy on the road especially running the low pressures that I found best for trail use, with more time I would try and see how it handled with normal 2.35″ tyres but I think the difference might be marginal. Climbing was great, the anti-squat of the rear design works great at stiffening up the rear, even with the rear shock on fully open, climbs weren’t a problem as the rear end tracked well over both technical and smooth climbs. The rear end did respond a little better to climbing in the middle shock position and I didn’t think the Firm setting was necessary unless you had to ride for a long time on the road. The model on test had a 30t chainring and 11-46t cassette, definitely enough range on it and there is an option for Eagle 12 speed should anyone need more. The frame has no high front derailleur mount, the 2x build kits systems use a side mount derailleur setup which makes the frame design cleaner. ISCG05 tabs are next to the bottom bracket should you want to run a chainguide. There’s a huge amount of internal cable routing options, it has routing for Di2 electronic shifting, cable ports provide for the future Fox Live Valve when that is released and all the ports are a design where they clamp down on the hose to minimise rattle. The raw look of the frame looked great, in the sunlight you can see the carbon layup detail and see that a huge amount of high quality carbon has gone into the frame build. I weighed this one and despite being at the bottom of the range still came in at a respectable 13.7kg with pedals or 13.3kg without pedals (Note, actual weights will be slightly different due to the wheelset). Not bad for a bike that’s supposedly built to Mach 6 strength! 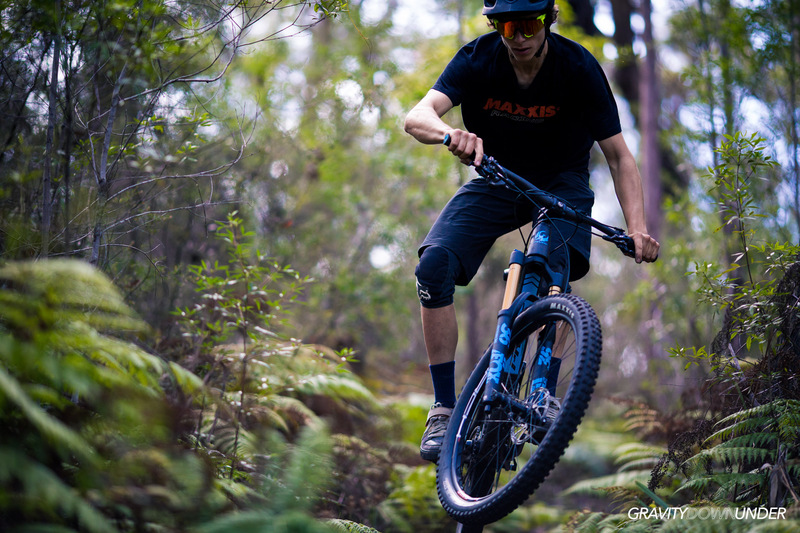 Besides the optional wheelset upgrade the other upgrade option is to upgrade the rear shock to a Fox Float X2, this would suit someone looking for a little more adjustability on the rear end and also more oil volume to better handle longer descents such as Thredbo. Exact pricing could not be confirmed at time of review but expect this to cost around $1000 extra. In summary this bike is one of the closest I’ve seen to a “one bike for all” trail bike, capable of bringing a huge smile to your face on the downhills but also being able to climb back up the top well. Plenty of clearance up front, too. The raw carbon looks excellent I think! EWS: Want to race in 2018? Everything you need to know is right here!